Also referred to as the jumbo squid, the Humboldt is one you do want to recognize. They aren’t as long as you would think with a name like that though. They only get to be about 7 feet long and weigh up to 100 pounds. They grow extremely fast though so those new offspring can get very large in a matter of months as long as they have enough food to nourish their bodies. They have the ability to change their colors from shades of red to shades of purple and then white as well. Some people used to believe this was for hiding but it is now believed it is for communication purposes. Due to the different colors the Humboldt squid is often misidentified. The name for this species of squid is derived from its main location – the Humboldt Current. This is found in the East Pacific Ocean region if you aren’t familiar with it by name alone. The are sometimes found along the coastal region of California as well. Many researchers believe that the Humboldt squid also reside in Oregon, Alaska, and Washington. There have been some sightings in these areas thanks to newer technology. They are generally found about 2,300 feet down from surface of the water. This means you have to be actively looking for them or you will miss them. This is one of the most aggressive of all the squid out there but humans don’t need to worry. This aggression is toward their prey and nothing else. This is one of the few types of squid that live in groups. These groups are called shoals and there can be up to 1,200 of them in one. They can move around in the water at a speed of about 15 miles per hour. The social hierarchy in their shoals really haven’t been identified by researchers. They live an active life though that is generally over within a year. Since they are do deep in the water during the day there isn’t much we really know about their behaviors. At nigh the go to the surface to feed and that has been recorded in great detail by researchers. 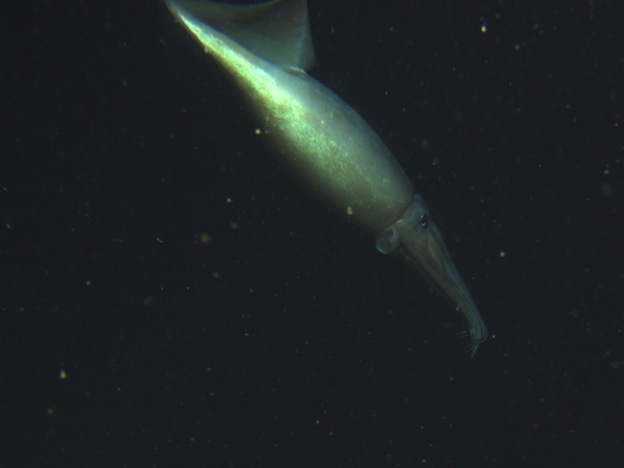 Humboldt squid- Dosidicus gigas / Photo taken by Rick Starr, NOAA. This species of squid generally feeds upon krill and various types of small fish. They tend to look for food close to the surface of the water even though they spend most of their time deeper down. They come up at night to feed because that is when they find their prey to be readily available. When they have limited supplies of food available, they will eat other members of their own shoal. The smaller members of it are the most likely targets. This type of cannibalism within a species is very rare. Some squid will eat other types but not their own species. The ability to change colors may be a factor for mating. The males may engage in it to get the attention of females. The exact process isn’t readily known. In fact, the eggs have never been seen by researchers. However, it is believed that they deposit their eggs in hidden locations at the floor of the sea as other types of squid do. While many experts agree that the Humboldt squid is not a threat to humans, others disagree. There have been some reports around the Sea of Cortez of divers and fishermen being attacked. It is believed this is due to an aggressive search for food though and not the urge to kill. Humans have interacted with them in captivity in an effort to learn more about them. Since they have such a short life span there is a great deal to learn from one in a short span of time.